Short circuit has been suspected as the reason of the fire, China News reported. BEIJING - Seventeen people were killed and 24 others injured in a southern Beijing suburb Monday morning in the deadliest fire the Chinese capital has seen in nine years. Nine men and eight women died in the fire, and most of them were migrant workers seeking accommodation in the building, said Wang Xin, deputy chief of the Daxing District Committee of the Communist Party of China. Out of the 17 dead, thirteen were workers hired by an unlicensed garment workshop called Yuyun and the other four were tenants in the four-story building. And 11 of the dead lived on the ground floor, said Wang. The 24 injured people, including a child, were rushed to hospitals. 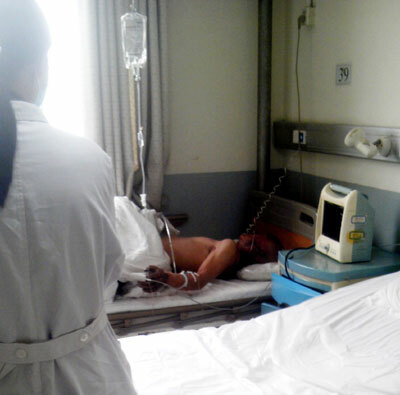 Ten of the 20 patients admitted by Beijing Youanmen Hospital were in serious condition and were transferred to Beijing Jishuitan Hospital, said He Lixin, deputy president of Youanmen Hospital. The fire broke out around 1 am Monday in the building in Jiugong town of Beijing's Daxing district. It raged for an hour before being extinguished around 2 am. Officials and witnesses said the fire started in the garment workshop. Trapped people were seen screaming and smashing the workshop's barred windows in an attempt to escape. Photos taken at the site showed that the windows of the building were blocked with iron bars, which were initially installed to ward off burglars. The bars prevented the trapped people from escaping. "We saw people jumping from the building. About six or seven people, clad in pajamas, flung themselves from the first floor after kicking open the bars on one window," said Wang Xuegang, a local resident. "It was a real nightmare. Some dived from the top floor and never rose again," said Wang. Fire engines were blocked by the area's narrow valleys, and firefighters had to manually carry hoses to the site to douse the blaze, said Wang. "The first floor was filled with choking fumes. With no way to leave, my wife and I jumped from a platform at the top of the building," said a survivor surnamed Xu who suffered broken legs. Investigations showed that the building was illegally built by a local resident surnamed Zhang in 2010. Zhang leased out the ground floor to the owners of the garment business. The floors above the garment shop were rented to migrant workers seeking inexpensive housing. The ground floor also housed the garment workshop's employees. One of the workshop's managers is also receiving medical treatment at the hospital. A further probe into the cause of the fire is under way. Liu Qi, secretary of the Beijing Municipal Committee of the Communist Party of China, and Mayor Guo Jinlong were at the site to direct the investigation. The blaze was the most fatal fire to occur in Beijing in about nine years. On June 16, 2002, a fire consumed an underground Internet cafe named "Lanjisu" and claimed 25 victims, mostly college students. In 2009, another fire made national headlines after it swept through one of the newly-built headquarter buildings of China Central Television (CCTV), killing one firefighter and injuring eight others.